Clemens Trautmann, President of Deutsche Grammophon, and Cherno Jobatey have known each other from the media scene in Berlin for a long time. In those days Clemens served as the office manager of Axel Springer CEO Mathias Döpfner. Eventually, they noticed a similarity in their CVs: both had studied music in America way before their current job. Clemens Trautmann at the Juilliard School in New York. Cherno Jobatey had made it to the West Coast, to the Musicians Institute in Hollywood. 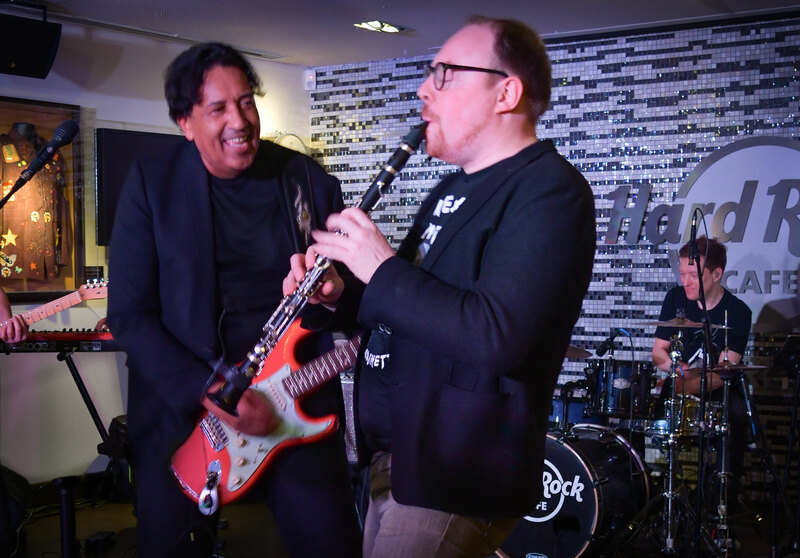 It took a while to find a suitable date to celebrate Jimi Hendrix on stage at the Hard Rock Cafe with Cherno Jobatey’s Groove Gangster GmbH. The Juilliard-alumnus is just awesome rocking Jimi Hendrix with incredible scales on his clarinet.